Force Majeure is the theme of Riga’s year in the E.U.’s cultural spotlight. The central message of the program is that culture is a force for positive change, and the city will host more than 200 special events throughout the year, from exhibitions and festivals to concerts by local and international musicians. Major events include one of the largest summer solstice celebrations in Europe, and the World Choir Games in July that will include 20,000 singers. In April, the notorious former headquarters of the Soviet KGB will reopen its doors as a museum. For all events, check the official Riga 2014 website for details and prices. 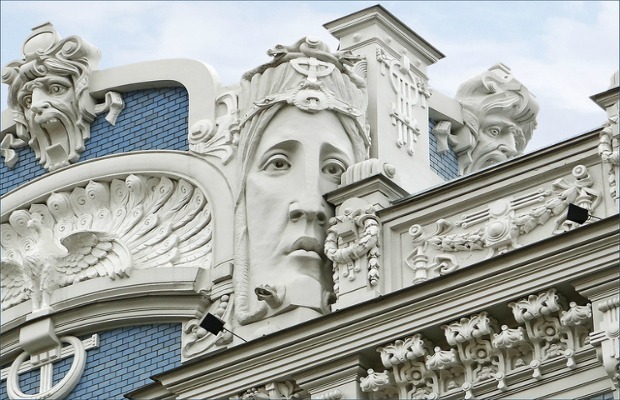 Like the city itself, Riga's architecture shows traces of its multifaceted existence. You can see examples from many different eras – Gothic, Romanesque, Baroque, and Renaissance. The city is perhaps most famous, though, for its UNESCO World Heritage-listed Art Nouveau district in the city center – an open-air (and free) display of art. Wandering through the streets with your head turned upward, you’ll find dozens of highly expressive, and often haunting, faces etched into the more than 750 buildings designed in the Jugenstil or "youth style" – a dramatic style of architecture that coincided with Riga’s late 19th century economic boom. Contemporary art galleries have sprung up everywhere in Riga. One of the best is Kim?, which stands for “kas ir maksla?” or, "What is art?" Housed in a 19th-century red-brick warehouse in the Spikeri district, this gallery hosts art shows, philosophy discussions, book readings, film screenings, and live music. Entrance to exhibitions is €3. In the city center, Galerija Istaba has a small ground floor art space, which hosts a free exhibition each month and is filled with cards, jewelry, and and objets d’art by local Rigan artists. Upstairs, a changing menu is served at Bufete Istaba, run by Martins Sirmais, one of the city’s most popular chefs.